Ontario is the most populated province in Canada with over 12 million residents. It is located in central-eastern Canada and it is the home to Canada's largest city, Toronto, as well as Canada's capital, Ottawa. The province of Ontario is a wonderful region of Canada that attracts many new residents and visitors year round. Northern Ontario is a great escape for nature enthusiasts. Many people come here every year to camp in Algonquin Park, canoe on one of the Great Lakes, hike along the Bruce Trail or even to relax along the beautiful shores of one of Ontario's sandy freshwater beaches. It is also a great region to visit if you enjoy snowmobiling, hunting, or exploring some of the lovely northern communities including Thunder Bay, Sudbury or Sault Sainte Marie. Southern Ontario is most famous for its many landmarks including Niagara Falls, the CN Tower, the Rideau Canal and Parliament Hill. Southern Ontario is also the center of Ontario's booming economy and many people flock here yearly in search of new jobs and opportunities. The busy urban centers of southern Ontario have become hubs for the manufacturing, financial and information technology sectors in Canada. The independent wine and beer industry has also boomed here in recent years. Many new regional breweries and brewpubs have opened throughout Ontario over the past two decades while the Niagara region has become the premier wine-producing area of Canada. Some famous people from Ontario include Dan Aykroyd, Jim Carey, Mike Myers, Martin Short, Wayne Gretzky, Eric Lindros, Bobby Orr, Frank Gehry, Gordon Lightfoot and Neil Young among countless others. There are 46,036 current live jobs in Ontario available immediately, compared to 13,952 in Toronto. The standard deviation of salaries for the results of this search is 82,429. 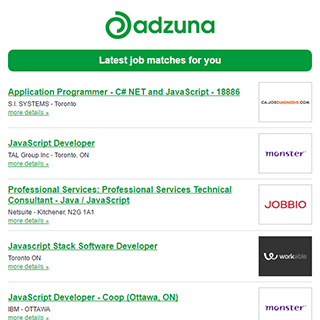 The Adzuna recency index score for this search is 0.71, suggesting that demand for current live jobs in Ontario is decreasing. The largest category under which open Ontario jobs are listed is Domestic help & Cleaning Jobs, followed by Teaching Jobs. Get the latest Jobs in Ontario delivered straight to your inbox!